Leading Manufacturer and Exporter from Noida, our product range includes Automatic Vacuuming Nitrogen Flushing & Sealing Machine, Vacuum Packing Machine, Vacuum Sealing Machine, Nitrogen Flushing Machine and many more items. Packing Material Heat sea lable laminated pouch material, LDPE, virgin films. Power 1.5 Kw, 230 Volt, 1 Phase, 50 Hzs. AC. Chamber size 450 mm x 450 mm x 200 mm. Air requirement 4-5 cfm at 6 bar pressure, dry and lubricated. 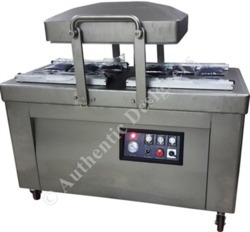 As a trustworthy organization of this domain, we are committed to offering our clients a superior quality assortment of Vacuum Sealing Machine. The vacuuming, nitrogen flushing and sealing machine is used for sealing or packing of pre-filled pouches of various products in a wide range of consumer pack with first vacuuming inside the pouch to evacuate the normal air which may have moisture, oxygen, and other bacteria then filled the controlled quantity of nitrogen or inert gas to give product a long shelf life and also protection before sealing the pouch with high speed in efficient and user-friendly manner. All granules and free flowing products as nankeens, wafers, rice, dry fruits, nuts, cereals, corn flakes, cashew nuts, pulses, candy, sugar, salt, sagum dana, suji, milk powder, detergent powder and much more. The electro-pneumatic technology used with Heavy Duty Vacuum Pump. High speed, reciprocating vacuum pump, to create the quick vacuum in the pouch. Control for the quantity of inert gas flushing in the pouch through the timer. Control for vacuum created in the pouch through the timer. Motorized adjustment for up and down of support platform. Both impulse and heat sealing system are possible. This machine is used for packing of pre-filled pouches of various products in a wide range of consumer packs with first creating vacuum inside the pouch to evacuate the normal air which may have moisture, oxygen and other bacteria then sealing the pouch to give the product a long shelf life and also protection from environmental contamination with high speed inefficient and user friendly manner. All products as rice, dry fruits, nuts, cereals, corn flakes, cashew nuts, pulses, candy, milk powder etc. Big chamber to accommodate more than one pouch at a time. High speed, reciprocating vacuum pump, to create quick vacuum in the chamber. Control for vacuum created in the pouch through timer.